I might be missing the obvious since this seems a bit strange of a behavior. Let's say we have 2 agents, Agent A and Agent B, and both have a Obstacle Avoidance radius of 0.5. 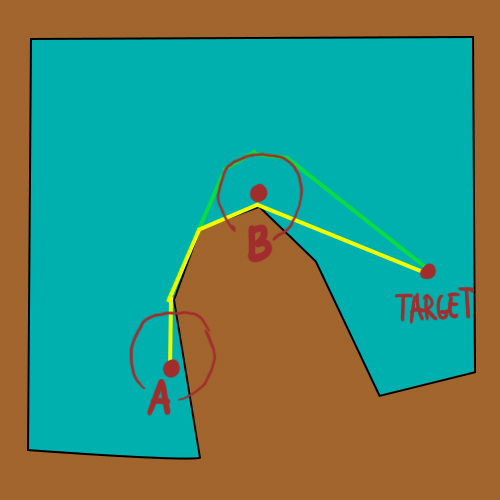 My problem is that Unity always Calculates the shortest route to the TargetPos (yellow path), and because of the Obstacle Avoidance, Agent A ends up stuck in the corner, unable to pass by Agent B. What I would like instead, is something like the green path in the image, where the calculation takes into account Agent B Obstacle Avoidance cylinder and plans around it. Or, since I've realized the agent avoidance doesn't re-calculate the path but does a local avoidance (at least according to the navmesh debug display), to take the longer route through the left side of Agent B so Agent A doesn't get stuck in the edge. Is there a way to do it? Is it part of Unity's NavMesh system? NOTE: When Agent B is not in a corner, the obstacle avoidance works, and Agent B goes around him. It's just in this situation, where going around means doing the LONGER distance, that he decides to go through the shortest path that he gets stuck. The Nav Mesh Obstacle component allows you to describe moving obstacles that Nav Mesh Agents should avoid while navigating the world (for example, barrels or crates controlled by the physics system). While the obstacle is moving, the Nav Mesh Agents do their best to avoid it. When the obstacle is stationary, it carves a hole in the NavMesh. Nav Mesh Agents then change their paths to steer around it, or find a different route if the obstacle causes the pathway to be completely blocked. Shape The shape of the obstacle geometry. Choose whichever one best fits the shape of the object. Center Center of the box relative to the transform position. Center Center of the capsule relative to the transform position. Radius Radius of the capsule. Height Height of the capsule. Carve When the Carve checkbox is ticked, the Nav Mesh Obstacle creates a hole in the NavMesh. Move Threshold Unity treats the Nav Mesh Obstacle as moving when it has moved more than the distance set by the Move Threshold. Use this property to set the threshold distance for updating a moving carved hole. Time To Stationary The time (in seconds) to wait until the obstacle is treated as stationary. Carve Only Stationary When enabled, the obstacle is carved only when it is stationary. See Logic for moving Nav Mesh Obstacles, below, to learn more. This is the default behavior. To enable it, tick the Nav Mesh Obstacle component’s Carve Only Stationary checkbox. In this mode, when the Nav Mesh Obstacle moves, the carved hole is removed. When the Nav Mesh Obstacle has stopped moving and has been stationary for more than the time set by Carving Time To Stationary, it is treated as stationary and the carved hole is updated again. While the Nav Mesh Obstacle is moving, the Nav Mesh Agents avoid it using collision avoidance, but don’t plan paths around it. Carve Only Stationery is generally the best choice in terms of performance, and is a good match when the GameObject associated with the Nav Mesh Obstacle is controlled by physics. To enable this mode, untick the Nav Mesh Obstacle component’s Carve Only Stationary checkbox. When this is unticked, the carved hole is updated when the obstacle has moved more than the distance set by Carving Move Threshold. This mode is useful for large, slowly moving obstacles (for example, a tank that is being avoided by infantry). Note: When using NavMesh query methods, you should take into account that there is a one-frame delay between changing a Nav Mesh Obstacle and the effect that change has on the NavMesh. Creating a Nav Mesh Obstacle - Guidance on creating Nav Mesh Obstacles. Inner Workings of the Navigation System - Learn more about how Nav Mesh Obstacles are used as part of navigation. Nav Mesh Obstacle scripting reference - Full description of the Nav Mesh Obstacle scripting API.